In 1975, the "CARABOBO" Reorganization Plan (1975-1990) was put into effect, which has imparted a very useful encouragement for the fulfillment of the mission and objectives of the Venezuelan Army, Forger of Freedoms. To the National Armed Forces, it corresponds primarily, to ensure the national defense, in order to guarantee the integrity and freedom of the Republic and the stability of the Democratic Institutions (Article 8 of the LOFAN). According to Art. 9 of the LOFAN to the Army corresponds the Terrestrial Defense and will have, in addition to the functions indicated in Art. 8, to organize, equip and train units for the execution of military land operations. It established the doctrine and procedures for the execution of land warfare and their participation in airborne or public order operations that are within their competence. Participate in the execution of military mobilization plans. Maintain the integrity of the land borders and contribute to their development. Carry out research and development activities in scientific and technical areas aimed at strengthening national defense. For the execution of its mission and objectives, the Venezuelan Army has the following organization: the General Command, the General Inspectorate, the General Staff, the Major Combat Units, the Major Commands, the Tactical Units, the Isolated Fundamental Units, the Teachers Institutes, Services and other dependencies. The strategic Operational command of the Bolivarian National Armed Forces (CEOFANB), through the Seven (7) Strategic Integral Defense Regions (REDI - regiones estratégicas de defensa integral), executes the Deployment of the Republic Plan in Venezuela, in twenty-four (24) Defence Operating Areas Integral (ZODI - Zonas Operativas de Defensa Integral - typically three per REDI, except for REDI Martime Insular with four and REDI Los Llanos with 5), four (4) Insular maritime Zones (ZODIMAIN - Zonas Marítimas Insulares) and ninety nine (99) Areas of Integral Defense (ADI - áreas de defensa integral). 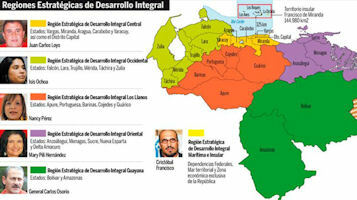 The Strategic Integral Defense Regions were created by Commander President Hugo Chávez, by Presidential Decree No. 6,417, on September 15, 2008, published in the Official Gazette of the Bolivarian Republic of Venezuela under No. 39,016. This precept is based on the need to comply with the provisions of the Organic Law of the Bolivarian National Armed Forces, which institutes in article 24, that the Strategic Integral Defense Region is a territory of the national territory with geostrategic characteristics, established by the President of the Bolivarian Republic of Venezuela and commander in chief of the Bolivarian National Armed Forces, based on the national defensive strategic conception to plan, conduct and execute operations of integral defense, in order to guarantee the Independence, the Sovereignty, the Security, the Integrity of the geographical space and the National Development. 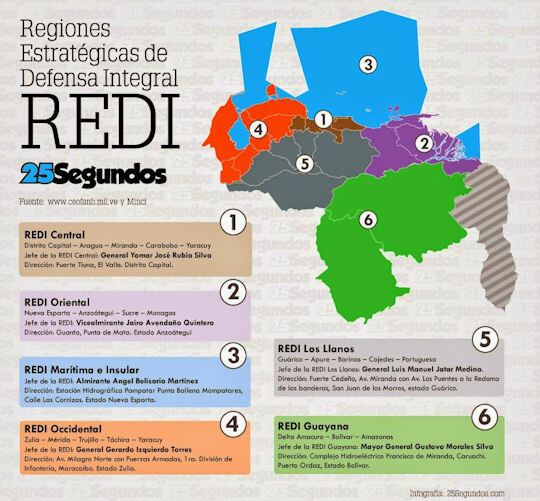 The Strategic Western Integral Defense Region with the purpose of contributing to the Operational Strategic Command (CEOFANB) will plan, program, direct, control, and strategically execute the specific and combined operations of the Bolivarian National Armed Forces together with the territorial defense mechanisms ( ZODI and ADI) complemented with the Bolivarian Militia throughout the western territory that includes the states; Zulia, Yaracuy, Lara and Falcón; establishing a defense in depth against the enemy forces both in times of war and in times of peace, in order to guarantee the protection of the West of the country and the protection of the Sovereignty and Independence of the Nation. Plan, conduct and execute operations of integral defense, with the forces and means of the FANB assigned, in the territorial space that corresponds to the states Merida, Táchira and Trujillo of the Bolivarian Republic of Venezuela; in order to guarantee the Independence, the Sovereignty, the Security, the Integrity of the Geographical Space and the Regional Development. For this purpose, the REDI commander Los Andes must: articulate the defense effort with the governing bodies of the people's power, exercise the Operational Command of the military forces deployed in the region, coordinate and supervise the civil protection organization, and disaster management in cases of catastrophes and public calamities that compromise the nation's security. 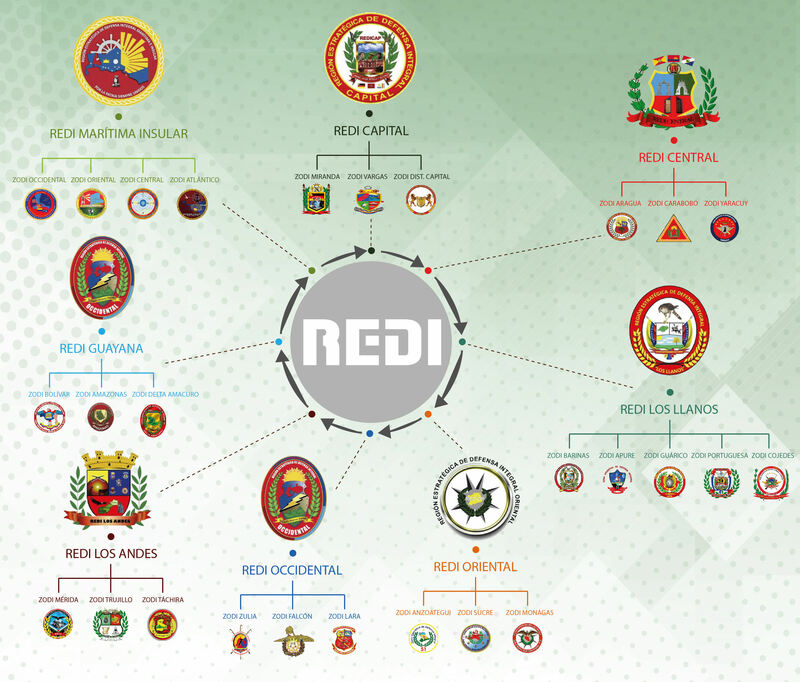 Together with the popular power and in accordance with the content of the constitution of the Bolivarian Republic of Venezuela and the "Plan of the Fatherland", consolidate the REDI Los Andes as the bastion of the Integral Defense of the Nation and contribute to converting Venezuela in an impregnable country through the planning and execution of Integral Defense operations throughout the geographical area of ? ?responsibility, the permanent cooperation in the preservation of the Internal Order in close coordination with the regional civil authorities, with the governing bodies of the people's power and counting with the active participation of the personnel, units and assigned means of the FANB in ? ?the integral development of the Andean states. Plan, conduct and execute operations of integral defense, in order to guarantee independence, sovereignty, security, integrity of geographical space and national development. To be a highly effective operational organization, endowed with the human, material and technology necessary to conduct military operations, military defense, maintenance of internal order and active participation in the regional development of its area of ? ?competence, thus contributing to guarantee independence , sovereignty, security, integrity of geographical space and national development. Plan, direct and supervise the strategic, joint and combined operational specific use of the Bolivarian National Armed Forces in the Capital District, and the Vargas and Miranda states according to the Constitution of the Bolivarian Republic of Venezuela and the Laws through integral defense, maintenance of internal order and active participation in the development of the Region, as well as executing operational plans to ensure geographical and air space, in order to guarantee national security, independence and sovereignty. Constitute us in a modern organization, with human capital, essentially professional and high sense of belonging, that contributes effectively with the Bolivarian National Armed Force in the process of the consolidation of the security and integral defense of the Nation. Plan, conduct and execute operations of integral defense, in order to guarantee the independence, the sovereignty, the security, the integrity of the geographic space and national development. "Achieve maximum efficiency in the Processes of Programming, Planning, Coordination and Control in the employment of the Strategic Integral Defense Region, aimed at promoting civic-military integration, popular mobilization and specific strategic operational employment, combined and combined Force National Bolivarian Navy, sustained its moral patrimony in the historical and fundamental pillars established in the Constitution; and its functional efficiency in the Bolivarian Military Doctrine, the Integral Defense Principles and the People's War of Resistance." Plan, direct and supervise the strategic, specific and combined operational use of the Bolivarian National Armed Forces in the Delta Amacuro, Bolívar and Amazonas states according to the Constitution of the Bolivarian Republic of Venezuela and the Laws through integral defense, maintenance of the internal order and active participation in the development of the Region, as well as execute operational plans to ensure geographic and air space, in order to guarantee national security, independence and sovereignty. Constitute a modern organization, with human capital, essentially professional and high sense of belonging, that contributes effectively with the Bolivarian National Armed Force in the process of the consolidation of the security and integral defense of the Nation and the protection of the territoriality of the States Delta Amacuro, Bolívar and Amazonas. Plan, conduct and execute Integral Defense operations in the maritime, insular, continental and aerospace space designated in accordance with the law, in order to guarantee the independence, sovereignty, security, territorial integrity and development of the Nation. Make the Maritime and Insular REDI "a modern, flexible and efficient organization, based on the ethical and moral values ? ?of the new Bolivarian military thought and doctrine, guaranteeing in the maritime and insular spaces, the integral security of the Venezuelan state, the normal development of the national life, the respect to the prevailing legal framework and the lively collaboration in the prosperity of the country. 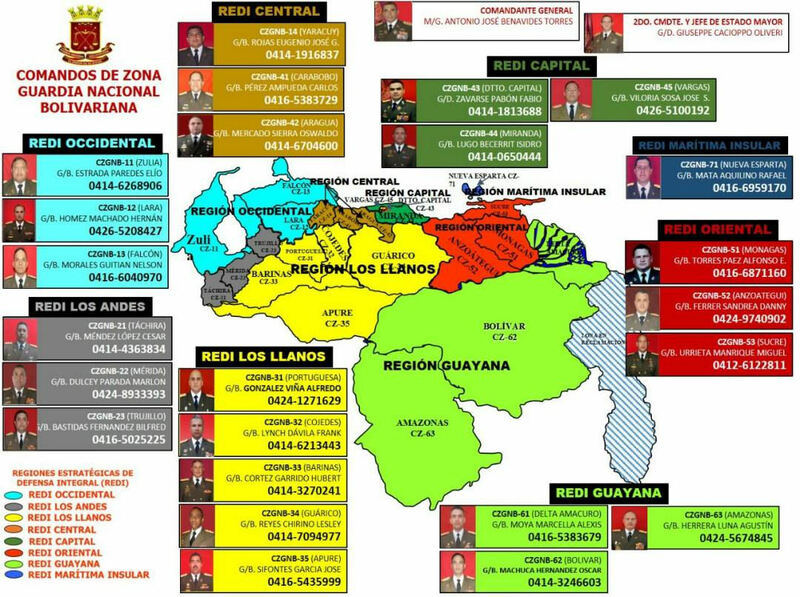 Plan, conduct, execute and supervise Integral Defense operations in terrestrial, aquatic and aerospace spaces in the jurisdiction of the Capital District and the Miranda and Vargas states, in accordance with the Constitution and Laws of the Bolivarian Republic of Venezuela, the treaties subscribed and ratified by the Republic, with all the military units and other functional operative and administrative organs assigned to it, in order to guarantee the Independence, Sovereignty, Security, Integrity of the geographic space and the development of the Nation. To become a structure of the Integral Defense that achieves from the Capital Region an impregnable and developed territory, with the active participation of the indissoluble binomial People-Armed Force, within the framework of the strategic military concept for the Integral Defense, with the full enjoyment of Independence , Sovereignty and Security of all its inhabitants.